Walk down memory lane with me for a moment – back to 1989. The scene: A freshly cut grassy field just off-campus near the University of Arkansas. REM, U2, Bob Marley, The Grateful Dead and Hank Williams Jr. blast from speakers propped up against bales of hay. A hundred or so soon-to-be graduates dance and sip on (cheap) cold libations. Frank* and his friends sport faded Levi’s and wrinkled white buttoned-down shirts, while my friends and I flaunt huge shoulder pads and blue eye shadow. This describes my previous visit with my friend Frank. Frank’s smile reveals to me something about him that hasn’t changed. At his core, he still has his cool vibe. Frank was lured away from his former company because his strategic thinking, his problem solving, his team building, his resilience – what I package all together as his ‘know how’ – is admired throughout the industry. To me, his cool V.I.B.E. is his know how. 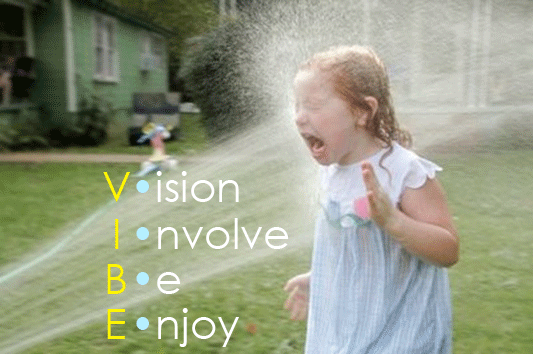 Action – What’s Your V.I.B.E.? In his new role, change is needed…and quickly. Here’s how Frank can think differently about how to apply his cool V.I.B.E. on his journey of continued success. Write down what your VISION is, and why this vision is important. What were you hired to accomplish? What does the Board expect you to do, and by when? What do you need to vs. want to accomplish? Refer to and evolve your vision as you connect with others and continue to learn. Outline who your stakeholders are, and INVOLVE them in the changes you need to architect. Stakeholders are those groups and individuals who care what happens next. Learn what is important to them: what are their hot buttons? What do they think needs to change? What do they want you to do to serve them best? Communicate with the team throughout the process to ensure all know what matters most, what’s changed. Involve them in the changes you believe need to happen. ‘BE’ whatever the moment calls for: Be prepared. Be open. Be challenging. Be aware. Be an active listener. Be confident. Be gracious. Be (a little) patient. In a new role, there will be many expectations and distractions that could make your head spin. Challenge yourself to be in the moment the best you can, while remaining laser-focused on your vision. ENJOY the challenges and opportunities of your new role. This can be difficult because of the pressing need you feel to make an impact as quickly as possible. Resiliency is about being able to see the forest for the trees, being able to bounce back from those fire hose moments. A challenging, interesting role at a company impacting the world. A beautiful family. Multiple connections with the community near and far. You’ve still got your V.I.B.E., Frank. You just may be defining it differently than you did in the spring of 1989 when your shirt was wrinklier. Fellow leaders, what tips can you share with Frank on what mattered most to your success in a significant role change? Thank you for sharing with us one tactic or idea so that we may all learn from your experience and earned wisdom. For additional insights on CEO transitions, see McKinsey’s articles on Managing CEO Transitions and Guide for the CEO-elect. For stakeholder analysis examples, see this identification and analysis worksheet and this one page matrix.